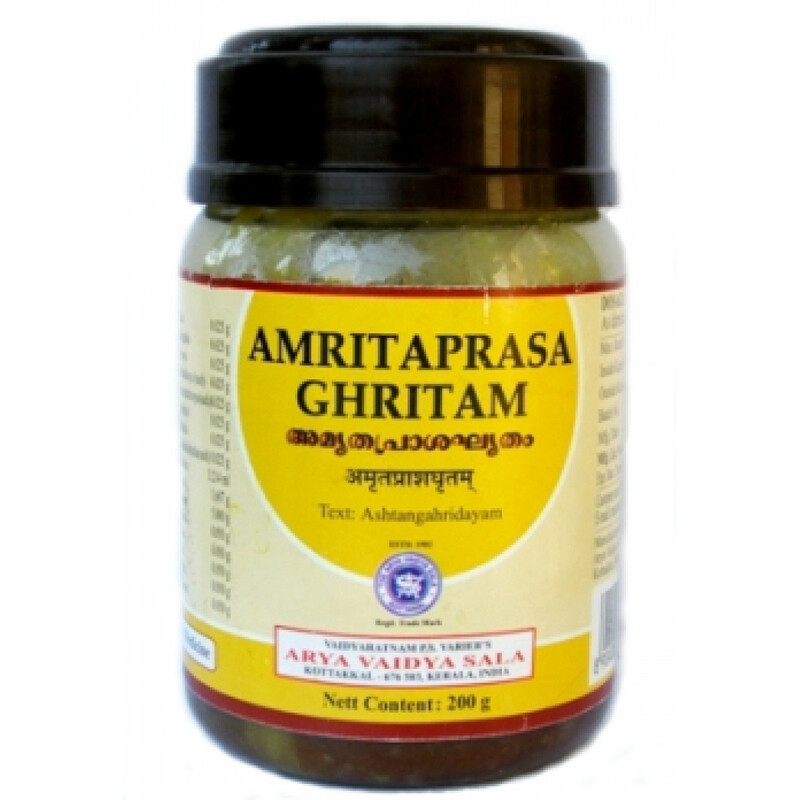 Amritaprasa ghritam is a powerful antioxidant. From the first days of treatment has a pronounced effect on the nervous system, sleep and digestion, at the same time toning the body and calming the agitated mind. Amritpal the grit refers to the number of the best rasayanas, known in Ayurveda as a rejuvenator that improves body's resistance to free radicals, various viruses and infections. Long-term use (over three months) Rasayana restores the immune system, weakened from chronic or intractable diseases, such as tuberculosis, diabetes, various tumours, psoriasis, syphilis and mental disorders. The composition of the herbs included in Amritpal, has beneficial effects on various pathologies of the heart, being a good heart tonic; nervous system, providing a mild sedative action; digestion – restoring the peristalsis of the intestine and improving the absorption of food; on the respiratory system, as a good lung tonic; liver and blood, possessing antibacterial and anti-inflammatory properties. The General effect of the medicine is aimed at strengthening the immune system and restore lost energy after serious surgeries and chronic diseases. Particularly indicated to people who have had radiation, surgery with large blood loss, suffering from constant ailments, anemia, people with a clear predisposition to tumor growth, women suffering from infertility and various chronic diseases of the female reproductive system, people who suffer severe forms of hepatitis and excited nervous system. In these cases, the course of treatment rasayanas should be not less than three months. Content: Shatavari, Ginger, Pippali, Nut, Abrakbhashma, Sita, Cardamon, Patraj, Clove, Mirch, Svarnmachik, Saffron, Ambur, Latakasturi, Tagar, Jayaful, Banslochan, Amalki, Ajmode, Chandan, Nagarmotha, Punarnaba, Chitrak, Nagkesar. - constipation and disorders of the intestine – take 1/2 tsp twice a day, before meals, in conjunction with Triphala (1/2 teaspoon). - Hepatitis – 1 tsp twice a day before meals, in conjunction with a strict diet and bitter herbs, at least a month. - For heart disease – Arjuna or special preparations normalize the functioning of the heart, which must appoint a physician. The dosage is 1/2 tsp twice a day, before meals as a preventive cases and 1 tsp. – during attacks. - For female infertility – 1 tsp with milk or water at night, together with Shilajit (Shilajit) or Chandraprabha Bati (2 tab. ), the course is not less than three months. With different disorders in the ovarian and hormonal changes in the body and must be consumed Rasayana with milk and saffron twice a day, before meals. The course is about two months. - If the myoma – for 1H.l. twice a day, in conjunction with the Hira Bhasma and Kanchnaar guggulu. The course is three months. - In hypertension – 1/2 tsp twice a day, together with Brahmi and Ashwagandha (2 tablets. or 1/2 tsp). - Insomnia – 1/2 tsp twice a day, together with Ashwagandha or preparations containing sarpagandha. - For gastritis with high acidity, gastric ulcer and duodenal ulcers should take 1/2 tsp Rasayana with milk and turmeric, 30 minutes after a meal. - With nervous exhaustion, together with Brami. - During acute infections and for strengthening immunity Rasayana desirable to use a term of not less than three months, as it has nakaplivaetsya action. Original name: Amritaprasa ghritam Arya Vaidya Sala. In our store You can buy authentic Amritaprasa ghritam Arya Vaidya Shala at the best price!